We carry the Gallon drums and 19 litre drums of Rust Bullet for Concrete. Covers approximately 300 square feet, per gallon, per coat, depending on the porosity and texture of the substrate. A minimum two coat application is required. Rust Bullet for Concrete not only improves the appearance of concrete, it provides an impervious shield allowing easy clean up of oil, grease and chemical spills along with strong protection against impacts, abrasives, and atmospheric elements. 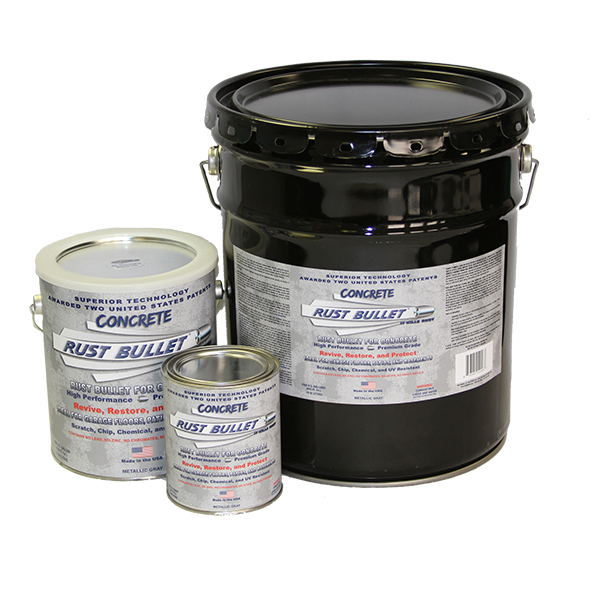 Use the Rust Bullet for Concrete for all your concrete flooring needs including garage floors, walkways, paths and much more. We know how important it is to protect your concrete floor, and Rust Bullet for Concrete is there to protect them for years to come. Coverage is approximately 300-400 ft²/gal/coat depending on the method of application and the porosity of the concrete or substrate. Minimum two coat application is recommended.